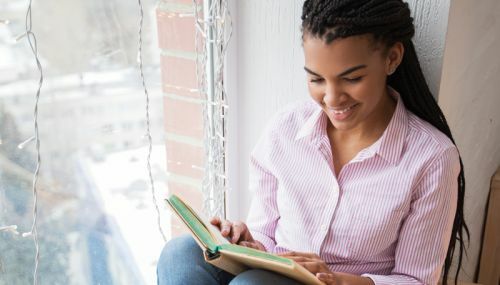 Teenagers who read in their spare time know 26 per cent more words than those who never read, according to researchers at the Centre for Longitudinal Studies (CLS). The research team, based at the UCL Institute of Education, found that teenagers who read often, and those who had access to plenty of books,were more likely to develop a better vocabulary than their peers. Analysing the scores of nearly 11,000 14-year-olds in a word exercise, the researchers found that teenagers who read for pleasure every day understood 26 per cent more words than those who never read at all in their spare time. And teenagers from book-loving homes knew 42 per cent more words than their peers who had grown up with few books. Even taking into account other factors, like parents’ qualifications and profession, and cognitive tests taken by the teenagers when they were aged 5, teenagers who read for pleasure still got 12 per cent more words right, while those from book-rich homes scored 9 per cent more. The teenagers, who were all born in the UK and whose lives have been tracked since birth, through CLS’s Millennium Cohort Study, completed a vocabulary exercise when they were 14. They were given 20 different words and five possible synonyms for each, and were asked to match each one to its correct synonym.Their parents also took the test, so the researchers could explore the extent to which parents’ English language skills are passed on to their children. The research team examined the results, alongside other information about the teenagers’ backgrounds, home life and leisure activities, collected over the past 14 years. The researchers discovered that if parents did well in the assessment, their children tended to also perform better. For example, if a mother scored in the top 25 per cent, the teenager got an average of 8 words correct, compared to an average of 6 words for those whose mothers scored in the bottom 25% per cent. While there were large differences in parents’ vocabulary scores, according to ethnic group and education, there was much less variation in their children’s scores. For example, Bangladeshi parents understood an average of 4 to 5 words out of 20, compared to the overall average for parents of 10 to 11 words. But their UK-born children actually gained higher scores than their parents, and just below the teenage average of 7 words out of 20. Mothers with a postgraduate degree on average got more than double the number of words right compared to mothers who had no qualifications (15 out of 20 compared to 7 out of 20). Among the teenagers, the differences, by parental education, were smaller; those whose mothers had a postgraduate degree scored an average of 9 out of 20, while those whose mothers had no qualifications still scored 6 out of 20. The findings from this study add to evidence previously published by CLS on the positive impact of reading for pleasure on children’s development. ‘The intergenerational transmission of vocabulary’ by Alice Sullivan, Vanessa Moulton and Emla Fitzsimons, is the latest CLS working paper. 1. The Millennium Cohort Study is following 19,517 young people born across the UK in 2000-01, building a uniquely detailed portrait of the children of the new century. The last survey of parents and children took place in 2015-16. 2. The Millennium Cohort Study is managed by CLS at the UCL Institute of Education and is funded by the Economic and Social Research Council and a consortium of government departments.